Get your walking/running shoes, grab your walking partner, and bring the stroller! Methodist is a sponsor of the 2018 Omaha "Fight for Air" Corporate Cup, a 10K run and 2-mile run/walk to benefit for the American Lung Association, on Sunday, Sept. 9, at Aksarben Village. Timing chips are included in the entry fee. *NOTE: Beginning Sept. 3, the registration fee will increase to $55. Methodist Corporate Cup T-shirts will not be provided this year. Instead, feel free to wear your favorite Methodist Corporate Cup T-shirt from a prior year or other MHS logo wear. Methodist will not deliver race bibs to participants. Team members may pick up their bibs during the times and dates listed below, or at registration the day of the race. Sept. 7 l 7 a.m. - 7 p.m.
Sept. (Event Day) l 6 - 8 a.m.
For online registration, payment via credit card is required -- click here. If a returning user, enter your user name and password. If a new user, select "Register, Join a Team." Enter “Methodist Health System” under Team Name. Select “Join” next to Methodist Health System. Note: Do not select a T-shirt size as Methodist team T-shirts will not be provided this year. Note: If you do not wish to receive emails from the American Lung Association, do not include your email address. Email address is not a required field. Note: You will choose Corporate Team when registering for your walk/run. The Kids' Race begins at approximately 9 a.m. Registration fee is $15 ($20 after Sept. 3) or free for children with race bib from the longer courses. 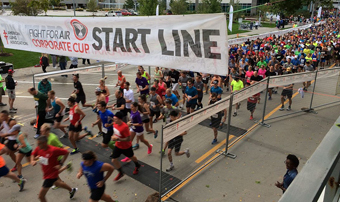 For registration and more information on the race, visit the Omaha Corporate Cup website.